Jungleside House, Sri Lanka - About the holiday home. 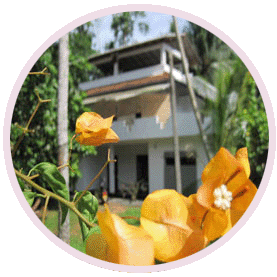 Jungleside House is located just five minutes walk from the beach at Wewelgoda just south of the popular Sri Lankan resort of Hikkaduwa, it's right in the middle of the largest and most beautiful bay in the South West of Sri Lanka. The jungle house at Hikkaduwa is perfectly placed to provide you with a comfortable base from which to enjoy the many attractions that the area has to offer. After enjoyable days spent surfing, diving, snorkeling, fishing or just basking on the beach in the Sri Lankan sunshine, watch the last of the red dusk sunset dip down into the Indian Ocean. Relax with a nice beverage or take a stroll along the beach and sample some of Hikkaduwa's seafood and nightlife. At night you may see a turtle coming ashore to lay her eggs in the sand and in the mornings you may be lucky enough to see the local fishermen hauling in their catch net! Enjoy all the advantages that come with renting your own holiday house or room only in Hikkaduwa and take everything at your own pace. As the Gallery shows, the views from the holiday villa of the mature jungle garden flora and fauna are simply gorgeous! You will see monkeys, fruit bats, iguanas and many rare bird species. The House has three spacious king bedrooms, one of which is en-suite, three fully fitted shower rooms, there is hot and cold water through-out, there are two outdoor cool showers on split levels, and two large kitchen / dining areas (one ground floor inside and one first floor balcony). On the ground floor is the open veranda with chairs and hammocks. On the first floor is a 54 feet balcony with hammocks and paddle chairs, on the 2nd floor a roof covered private recreational space that is suitable for functions, yoga, gym workouts or massage. The beautiful mature garden has many fruit plants, banana, mango, papaya, coconut and more. Each of the beds and chairs are professionally cut and hand carved from timber grown in the garden. All of the beds and plantation chairs were deliberately made over size, and the ground floor kitchen / dining table easily seats 6, this really is indoor and outdoor relaxation at its best. 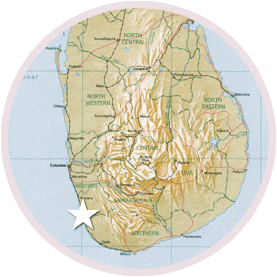 If you require transportation or assistance for the duration of your holiday in Hikkaduwa, our local guide is available to you and can be on hand to assist you. 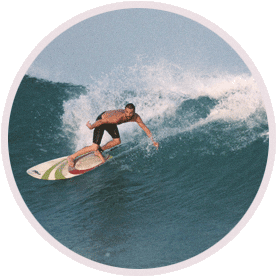 He will happily arrange surfing, fishing, diving (new untouched reefs on the North East and North West coasts), lagoon safaris as well as Hikkaduwa area and Sri Lanka-wide tours - now also including Jaffna peninsular. There is also bicycle, scooter (bring your international driving licence), Tuk Tuk and A/C taxi hire available at reasonable rates, so there is no need to walk any where if the weather is too hot. 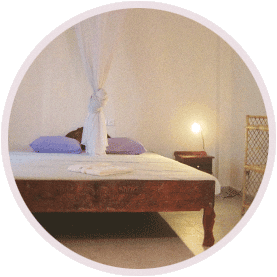 The house is 5 miniutes walking distance from the beach, shops and supermarket.